Gluten Free Hawaiian Rolls Recipe from Bakes Bread - with shaping videos! 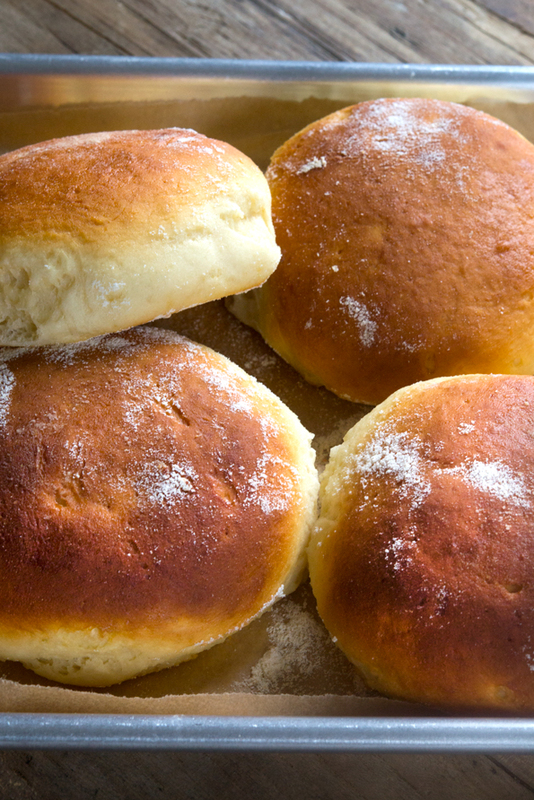 Home > Breads > Gluten Free Hawaiian Rolls from Bakes Bread – plus shaping videos! Gluten Free Hawaiian Rolls from Bakes Bread – plus shaping videos! This recipe for soft and tender gluten free Hawaiian rolls makes the perfect gluten free bread for any occasion—for everything from dinner rolls to burger buns! 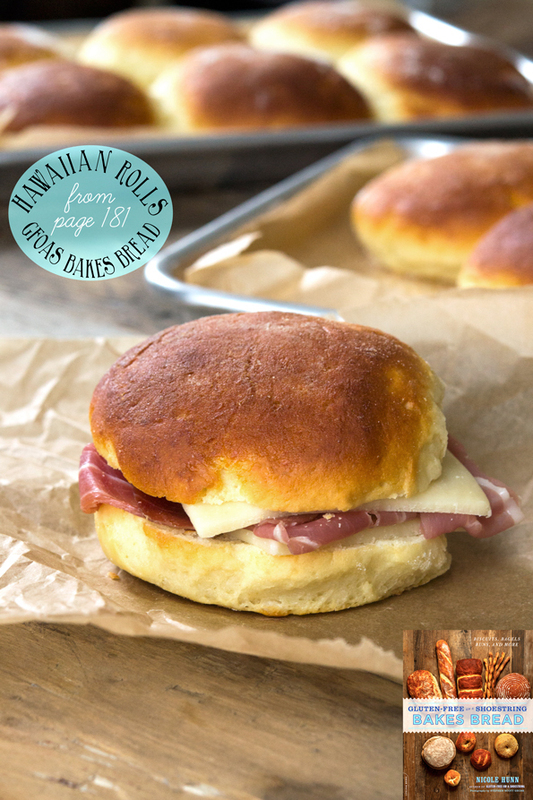 The recipe for gluten free Hawaiian rolls from page 181 of Gluten-Free on a Shoestring Bakes Bread is just too good not to share. I’ve included everything you need to know about baking the best gluten free bread you’ve ever had. This includes general shaping instructions for all of the gluten free bread in the Bakes Bread book. It also includes specific instructions for shaping small, round rolls like these. Rolls like these are going to change the way you think about gluten free bread forever. For real. The instructions in the book for these Hawaiian Rolls are to make 12 dinner rolls, but these days I find myself making them into 8 full-size buns instead. They make the most delightful sandwiches! I simply love the soft, tender crumb of the bread, and the way the outside browns just right. The dough can be handled more like “regular” bread dough. You might just think you’d reached for wheat flour! Here they are, all shaped and ready for their second rise. The short video below shows the “scrape and fold” technique that I recommend using to shape my new style of gluten free bread dough. I can describe it with words, and I do in the recipe below. But there’s nothing like seeing it for yourself. I also thought you might like to see what it looks like when I shape this dough into rounds. You want to work quickly, and use a light touch. All of the written instructions for this are reprinted below from the book. I’ve included everything from general shaping instructions for all of my gluten free bread dough to specific instructions on how to shape rounds. If you have previous experience shaping conventional yeast bread dough, all of that will come in quite handy here. Gone now are the day when working with gluten free yeast bread dough meant sad, weepy mounds of dough that looked more like cookie dough than bread dough. And unlike gluten free yeast bread of the past, these rolls have two rises. That means that the dough is easier to handle still, and there is even some flavor development in the yeast. Since this is an enriched dough, meaning it has butter and milk in it, you don’t want too much yeast development, though. If the dough begins to “dimple,” it’s beginning to overproof, or rise too much. Be sure you get it right into the oven, then. You want a nice, smooth rise. 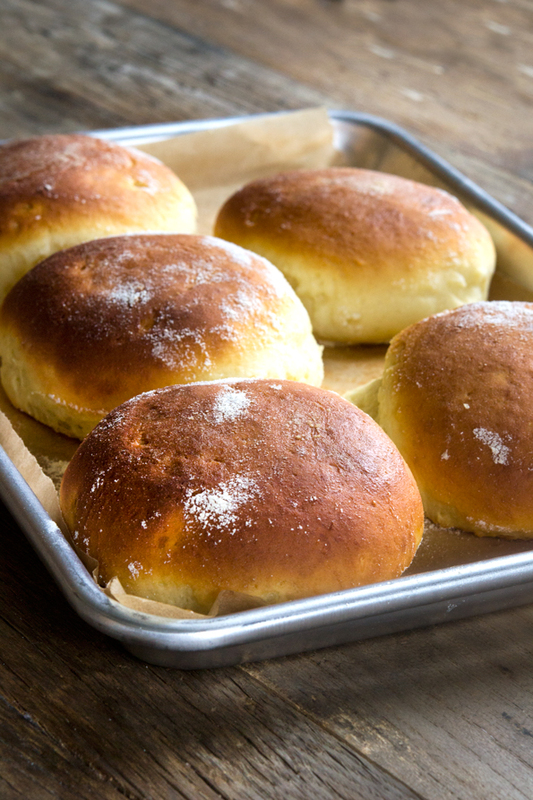 These rolls you see here weren’t topped with an egg wash before baking. They’re simply perfect, just as they are. I know some of you are scared to bake yeast bread. I know some of you wish the recipes were ready immediately, rather than having to wait for a few days’ refrigerator rise. But good yeast bread takes time. This is not because it’s gluten free. It’s just the nature of yeast development. If you’re looking for something closer to instant gratification, try the gluten free English Muffin Bread from page 74 (reprinted on the blog, as well). No starter, no refrigerator rise. Make the dough and bake it in about 1 1/2 hours. It’s a super soft, mild-tasting, high-rising loaf of gluten free bread. **For the all-purpose gluten-free flour in Gluten-Free Bread Flour, you can use either the High-Quality All-Purpose Gluten-Free Flour (below) or the Make-It-Simpler All-Purpose Gluten-Free Flour (below that). For this recipe, the High-Quality All-Purpose Gluten-Free Flour is best. It is a copycat recipe for Better Batter gluten free flour, so the commercially available Better Batter all-purpose gluten-free flour blend will also work well. Place the flour, yeast, and sugar in the bowl of your stand mixer, and use a handheld whisk to combine well. Add the salt, and whisk to combine. Add the butter, egg, pineapple juice, and vanilla, and mix on low speed with the dough hook until combined. Raise the mixer speed to medium and knead for about 5 minutes. The dough will be quite sticky, but should be smooth and stretchy. Spray a silicone spatula lightly with cooking oil spray, and scrape down the sides of the bowl. Transfer the dough to a lightly oiled bowl or proofing bucket large enough for the dough to rise to double its size, and cover with an oiled piece of plastic wrap (or the oiled top to your proofing bucket). Place the dough in the refrigerator for at least 12 hours and up to 5 days. On baking day, grease an 8-inch round baking pan and set it aside. 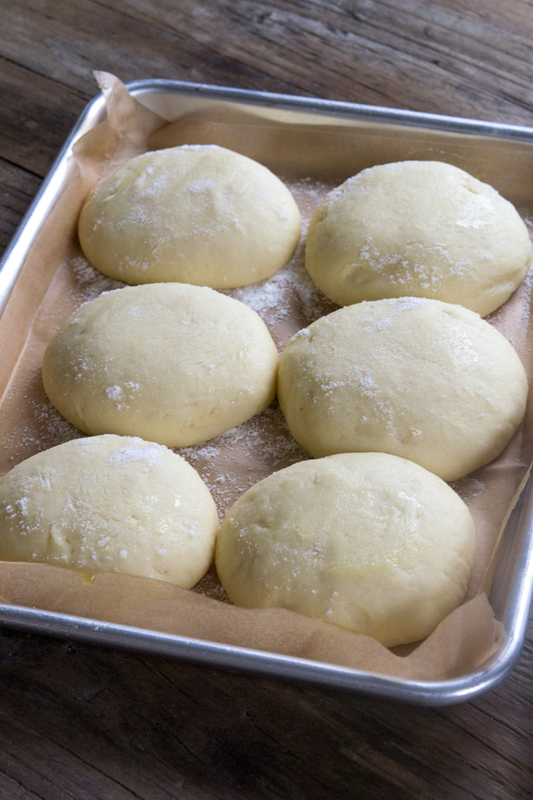 Remove the dough from the refrigerator and turn it out onto a lightly floured surface. Knead until smoother as described in the General Shaping Tips below. With a floured bench scraper, divide the dough into twelve pieces of equal size. Shape one piece into a round by following the Directions for Shaping Small, Round Rolls below. Place the first roll in the prepared baking pan. Repeat with the remaining pieces of dough, placing the rolls less than an inch apart from one another. 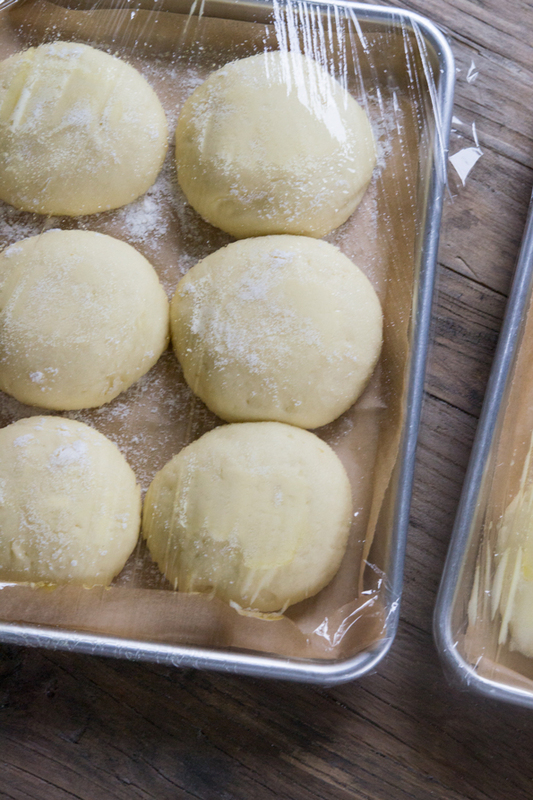 Cover the baking pan with oiled plastic wrap and set it aside in a warm, draft-free location to rise for 30 minutes. Uncover the pan and brush the rolls generously with the egg wash. Allow the rolls to finish rising, uncovered, until fully doubled in size (about 20 minutes more). About 20 minutes before the rolls have completed their final rise, preheat your oven to 350°F. Place the baking pan on the lower rack of the preheated oven and bake until lightly golden brown, and the inside of the rolls registers about 185°F on an instant-read thermometer (about 20 minutes). Allow to cool briefly in the pan before serving. Unless otherwise noted, always begin on a well-floured surface with floured hands. With the help of an oiled bench scraper, keep moving the dough as you shape it, particularly if it begins to stick to the surface or your hands. The process of kneading the dough in this book will be done using the scrape-and-fold method: Scrape the dough off the floured surface with the bench scraper, then fold the dough over itself. Sprinkle the dough lightly with flour, scrape the dough up again, and fold it over itself again. Repeat scraping and folding in this manner until the dough has become smoother. Keep the outside of the dough and the surface covered in a light coating of flour as you shape the dough. Handle the dough with a light touch to avoid kneading the flour into the dough, which might dry it out and result in a tight, unpleasant crumb. It bears repeating: A light touch is the key. 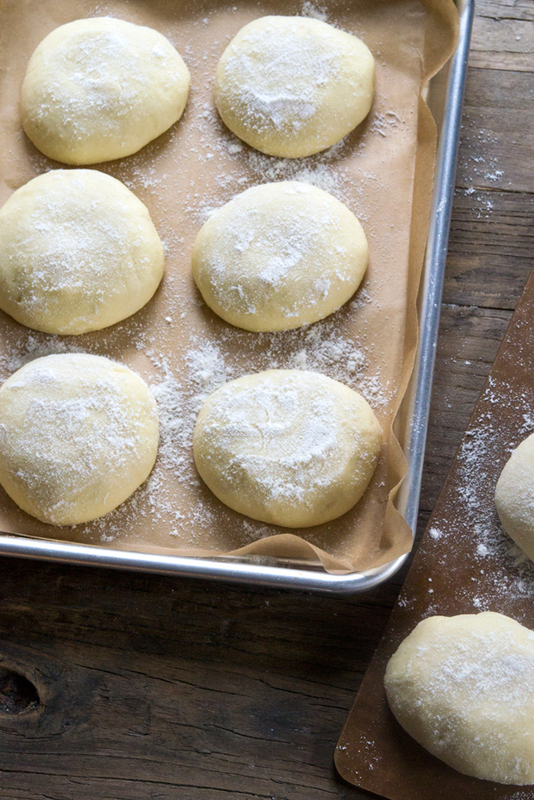 Repeat that to yourself as a mantra as you first learn to shape this bread dough. It’s the most important rule in shaping. More technique, less muscle. You’ll notice that the recipes do not include instructions to allow dough that has been rising in the refrigerator to come to room temperature before shaping. Always begin with cold dough when shaping the dough in this book. It is much easier to shape. On a well-floured surface, flatten the dough into a disk, then pull the edges toward the center of the disk and secure the edges together by pressing them between your thumb and forefinger. Turn the dough over so that the gathered edges are on the bottom and cup your whole hands around the dough, to coax it into a round shape. Place the round of dough on a lightly floured surface and cup only one palm around the dough with the side of your hand resting on the counter (the side of your hand nearest your pinkie). Maintaining contact between the side of your hand and the surface, begin to move your hand in a circular motion while gently coaxing the edges of the dough upward (toward the top of the round) with the tips of your fingers. Slash the dough with a sharp knife or lame held at a 45 degree angle to the dough. I’m working my way through the book. Got my sourdough mother starter made and mixed up the Pain au Levain. (Weighed all the ingredients and used Better Batter flour. ) It seemed awfully soft , but I put it in the refrig for two days and took it out to bake this morning. The dough was really soft and sticky. I had to work a lot of flour into it (1/4 cup maybe) to be able to shape it at all and it was still considerably softer than the dough in you Hawaiian rolls video. My question, should all the doughs in the book be firm enough to shape? Second question. I bought the proofing chamber but I don’t know what temperature to set it for. Thank you so much for all your work. You can’t just use Better Batter in the wild yeast sourdough starter, or the levain bread. There are a number of different flours required for the liquid starter, and then you must use the Bread Flour blend in the book for creating the mother starter. There are photos of every step in the book. Please review those along with the narrative in the book to try to figure out where you went wrong. No, it is not that soft at all. 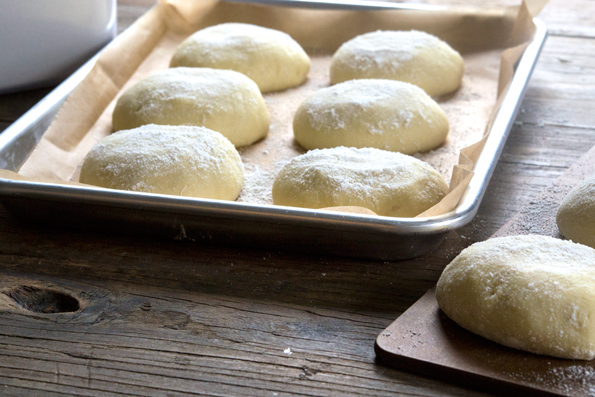 The Hawaiian bread dough is typical of the doughs you will find in the book. I simply can’t hazard a guess myself as to where you went wrong, as there are so many steps and I’m not there with you in your kitchen. Pay careful attention to the step by step photos in the book. And at the beginning of the sourdough chapter, the lead photo of the dough popping out of the bucket? That’s the levain bread dough. You can set your proofer to about 80°F. is instant yeast the same as Bread Machine Yeast? The terms do tend to be used interchangeably, Tania. I have always used Red Star rapid rise instant yeast. This sounds so much like Artisan Slow baking. This Slow baking naturally eats gluten in its fermentation process which makes the bread GF naturally. So is it necessary for GF flour? Kari, I’m not familiar with ‘artisan slow baking,” but yeast fermentation does NOT remove gluten from bread. Only gluten free flour makes for gluten free bread! There is no way to remove gluten from gluten containing products through baking. Even the gluten free beers that claim below 3 ppm still contain gluten and will impact you if you have celiac disease. Do not believe it when somebody tells you the gluten is processed out. For those with egg allergies, can most of these recipes use an egg replacer or a “flax egg”? I’d love to buy your book, but can’t use eggs. Shruti, many of the recipes don’t rely upon eggs at all. Only the truly enriched breads, like brioche, require eggs. This is very unusual for gluten free bread, but common with conventional bread. This is much more like conventional bread-baking than gluten free bread-baking has ever been before. Are you familiar with. Domata flour? It is available here and I would like to try these rolls. Also can these be made ahead an frozen? Have ordered three of your cookbooks for Christmas gifts for my grown kids that are gluten intolerant. Keep up the great work. It is wonderful to have great gluten free food after years of make do. Yes, I am familiar with it. It is a pretty high-starch blend, Martha. You can try it as the all purpose flour in building the bread flour blend , but I can’t promise anything. Good luck! Could you use margarine instead of butter? My daughter is dairy intolerant too. I don’t recommend margarine, Lyn. Thanks for posting the videos. I’ve been working my bread too much now that I’ve watched you. Helps a ton to see you do it! My Japanese Milk Bread turned out like a dream tonight! Thanks again for all your hard work…we really do appreciate it! Love the new book! Great, Jenny! That’s why I repeat over bad over in the instructions that a light touch is key! So glad you’re enjoying the new book! What could I use instead of the pineapple juice? My husband can’t have that. I don’t care if it doesn’t have that special “Hawaiian” taste, just the texture looks awesome. I haven’t tested this recipe with another juice, Cheryl. I’d try something similarly high in acid to pineapple juice. Good luck! I finally got my Expandex. Trying pizza first. I just wanted to tell you too that I LOVE that the dough does the cold rise. At first I didn’t think I would like it but it really does make mealtime so much easier. I love that I mix it all up the night before and then pull it out to rise / bake while I work on the rest of the meal. Exactly, Jennifer! Spread the word! A refrigerator rise is key to flavor development, texture, and makes it a make-ahead timesaver! Shoot, the ingredient whey protein in that bread flour and the pectin I don’t even have or know anything about it. I only cook GF for our grandsons wife. She thinks gluten bothers her and it seems too. Let me see if I can get a photo of the finished product. Not as perfect as Nicole’s in the book, but man, I’m pretty proud of it. And it smells wonderful. My husband keeps asking how much longer he has to wait to taste it. How awesome, Candice! And that is the romance of baking yeast bread!! Nicole, it is true that you are only 1 person but you are the mighty 1 and the number 1 to us! I have yet to order different flours to create the blends. That scares me! Heck, I just became acquainted with Better Batter. I wanted to use up the flour I have in my pantry, which I have not, but I needed the BB for my pie crust. I was going to order more BB after Thanksgiving, but they were out. I bet that has to do with this book! I just looked at their website and they are back in stock. I cannot place order until Friday though. I am also hoping that I can also get the Expandex from someone, somewhere at that time. How much Expandex should I order? I also have to get the essential equipment to be able to bake bread. You know that equipment is the contents of my Christmas list, right?! I have to take baby steps because I am PETRIFIED to do this. Never baked bread (besides banana bread or ginger bread prior to diagnosis) before. Have a bread machine and never used it (a gift from hubby that I never even asked for). It might all be in my head. Thanks for the videos, it alleviates some of my questions for you! I thiink I’m going to play with Jules flour in place of the mixes since it contains expandex until it’s available. I’m too excited to wait to try these and just bought my book on kindle. Hi, Michelle, I’m afraid that isn’t a great idea. Jules has so much Expandex in it that it’s the very first ingredient in her blend. It soaks up moisture like nobody’s business and would throw absolutely everything off in the recipes. If you are anxious to get started (and I love that you are! ), then I would try Ultratex 3 from Willpowder. Even Ultratex 3 (which is weaker than Ultratex 8) is considerably stronger than Expandex, and I am still working on a proper conversion, but you might want to start at using about 1/3 the amount of Ultratex 3 as you would Expandex (so, instead of 15 grams per 140 gram cup of bread flour, try 5 grams, and make up the other 10 grams with all purpose flour). And go from there. The Jules experiment will NOT pan out! Ultratex 3 is in stock on that link I included above (even though it is out of stock on amazon.com – sorry about that there’s a nationwide run on these sort of things right now!). These look so yummy! I’ve never bought a cookbook where I literally wanted to make every single recipe in it! I think I’m going to have to start buying supplies in bulk. It was easy to mix up dough yesterday and I love that it lasts in the refrigerator for days so I can wait until later to bake it. Breaks up the process into steps and I mixed up pizza dough yesterday that I’ll use to make pizza tomorrow. Cuts down my prep time at dinner time. Candice that is music to my ears (as you might imagine!). I have pizza dough in the refrigerator, too, that I plan to use in a couple days! Whenever I use one bucket of dough, I try to refill that bucket that same day with more dough since making more dough is usually very quick. So glad you’re enjoying!! Hi Nicole, when will the book be available in the UK? Loving your approach!! Hi, Katie, it should be available through Amazon.co.uk (I will check with my editor – we had a delay due to a rights transfer issue – but I would have expected it to be available by now). It does seem like it’s available from other sellers through amazon.co.uk, now, though. So sorry for the delay! Hi, Katie, I know my publisher is working on making it available to buy through amazon.co.uk (there was a delay because of a rights transfer issue). It looks like amazon.co.uk does have it available through “other sellers.” Maybe that helps? I will check with my editor on their progress with the UK amazon site, though! So sorry for the delay! I was so looking forward to this book. Hand made – not machine made – GF breads. I had hoped hubby could get it for me for Christmas. Then I read about the Expandex issue. That it is not – NOT – available in Canada. Yes, some US places will ship it to Canada, if you buy several pounds and pay upwards of $30 for shipping. Getting the Better Batter company to make it available doesn’t really help, does it, since Better Batter is not available in Canada, either, except at Winners/HomeSense which only get what their purchasers can get cheaply when they can get it. I was just in both stores, this past weekend, asking about the availability of Better Batter. They said they do carry it “from time to time” but they never know if/when they will get it. They currently carry a GF flour mixture by a company I’ve never heard of. From what I’ve read, online, getting Expandex in Canada has been an ongoing issue for several years. Sad, really, but not surprising. I live in Ontario Canada and I order Better Batter to be shipped to home (I take advantage of sales) and was also able to order the expandex. Yes, shipping is $30, but I ordered 3 bags so I won’t have to worry for a while. The way I look at it, it is available and still cheaper than a tank of gas to pick it up across the border. All depends on how you look at it, in my opinion! I made these and they are FABULOUS. Love the video. Very helpful. Will you marry me? Can I come to Friday pizza night? I will bring the untraditional BBQ Chicken Pizza (the thick pizza dough from your new book is in my awesome new proofing bucket mentioned in the book, enjoying its slow rise). I know that it isn’t a traditional pizza and most New Yorkers cringe. Are you game? Or are you traditional? Inquiring minds…. Are you kidding me, Kclark?! I’d be all OVER that. I love all kinds of pizza. I am a total omnivore, and anyway that sound fab. New York pizza, for the most part, is terrible. Italy, it’s not! BBQ chicken it is! Awesome, see you Friday! It’s only an all day flight from the West Coast. My family won’t mind. Love the new cookbook! Having all kinds of wicked fun trying to decide what to bake next. Bagels this weekend I think! I was also invited to a gluten cookie party. You know the kind. I considered not going but there are about four of us that are GF so we are all making cookies from this site. For those of us who cannot have the whey protien, is there a substitution? I speak about this quite extensively in the new book, Victoria, on pages 10-11. I tested at least a dozen proteins, and NOW Foods pea protein (isolate) and Growing Naturals rice protein isolate (original flavor) are the best, but you have to make other allowances by increasing moisture and increasing baking time. See the book for full details. SOOO just for clarity’s sake, do you use the whey base in most of the new recipes? I know we are always asking you to hack your hard worked recipes for us GFDF but we want in on your deliciousness too! All of the yeast bread recipes, Savanah, as part of the Gluten Free Bread Flour blend. Thank you for being so kind in your request. I want you to join in, too! I think that’s really key, Laura, and thank you so much for chiming in. I can’t find Better Batter in any stores near me, either, and never have been able to. So I have always ordered it (and other component flours when I make my own blends) online. I do have to pay quite a lot of shipping on component flours, but I try to do it as smart as possible, and then just bite the bullet! I’m glad you both have the finances available to be able to make such purchases. I do not. Nor do I want to buy three bags of a product I have never tried. The smallest Expandex I could find was 5 lbs. It would be time expired before I got 1/4 of the way through the bag. I also prefer to spend my hard earned money helping my own country’s economy, not someone else’s. still require you to support another country’s economy. I am grateful to Nicole for creating this eureka flour mixture and that she was willing to share it with us. I couldn’t imagine being flustered at her for recommending ingredients that are a little hard to locate. For me, even the slightest possibility of being able to turn out an amazing product for my family is worth it. That is how good-bread-starved we have been! As of now, we spend a fortune on gluten-free baked products that are mediocre at best. Anyway, Cathy Down, it sounds like Nicole is working tirelessly to make it easier for us to locate such ingredients. Hang in there – I’m sure you’ll figure it out. Oh that’s hysterical, Donia! I had to watch it a few times myself to see what you meant and then … I saw it. That was my husband, and why in the world didn’t he just move it quickly?! Why the slow mo? No idea! Brian H… Inquiring minds want to know! Probably just to not make it abrupt. But I loved both videos! Hi, LyttleO, I would like to stick to questions about baking gluten free bread and the bread book tonight, because the time will go quickly and I’m only one person answering, but you can always ask other questions at other times on Facebook. I will answer, just not instantaneously. :) That is a very well-tested recipe, so it will work if made properly, but offhand I’d guess that your oven temperature is off, assuming it is rising in the oven and then falling as it cools. A too-hot oven will cause baked goods to bake on the outside before the inside has a chance to support the loaf as it cools. Good luck! First, my dough is very thick and sticky so much that it climbs up my hand mixer and I’m constantly stopping to scrape it down and having a tough time mixing in the pumpkin butter evenly. The recipe says “scoopable” but does that seem right? Second, it does indeed rise in the oven but even ends up tearing horizontally…Third, it condenses as it cools and becomes very dense and seems moist inside. I do have a oven thermometer so I’m pretty sure its not oven temp but unfortunately no scale yet so I know I must be off somewhere. I am not using any substitutions. BTW, this question is open to anybody who can find time to chime in and help troubleshoot that would be great. CONGRATULATIONS!!! This is a very exciting time for you. You must be so proud. I love the pictures and the videos you have shared with us today – so beautiful! Once I get my expandex (which is not here only because I waited until after I had the book in my hands to order), I’m going to town!!! I will try to catch the last part of the blog Q&A after Girl Scouts tonight – dang those time zones. Are you going to be on the Today show???????? Best wishes for big big sales!!! Thanks for all you do – you are the best GF foodie around! Of course I’m not going to be on The Today Show, Jennifer! That’s why it said *snort*. ;) There has been a nice amount of press about the new book, and should be more, but not that big. Gluten free is still a bit of an ugly stepchild, I’m afraid. All the more reason to keep making it as “normal” as possible! And … by the way we hit the threshold of 500 orders in the past 2+ weeks, so the BIGGER giveaway has been triggered! Drawings at EOD tomorrow! Well, I wouldn’t past you girlfriend. If and when you are on the Today show, I’m coming to stand outside and watch! I think I’ll start writing NBC and the food network some letters – it’s about time gluten free recipe developers, chefs, cooks, bakers, etc… like you start getting some props. We’ll make it happen! Yeah right, Jennifer! I appreciate the vote of confidence, but gluten free is still considered “fringe.” It’s maddening! Unless you are already famous, and then you can use your fame to sell cookbooks and products! And give un-true information about celiac disease on TV! So, where it says High Quality Gluten Free Flour we can substitute Better Batter? Since my shoe string is really short (SSI income plus food stamps), which route is cheaper? When I reviewed Better Batter, along with 3 other gluten free flour blends, a couple years ago, I priced everything out and it was cheaper to buy Better Batter. I haven’t priced it in a couple years, though, so if you want to be sure I’d price it all out and compare. Great recipe choice for Publication Day! Makes you want to buy the book! I wish I could secure those specialty ingredients today and could make these today. I’ll have to wait till next week tho. Thank you for improving the lives of Celiac’s and GF folks like us. I wish you could, too, Lisa! Once the Expandex supply issues are resolved (hopefully very soon! ), it will alllll be worth it. I promise! Have a great time at the Live Q&A! These rolls look beautiful and the videos will be a big help with shaping. Loving my bread book, did we buy enough for someone (me!) to win the day of baking with you? I hope so! Congratulations on your big accomplishment! We DID IT, Anneke!! We were within a hair’s breadth of victory, and I just got word last night that we hit 500 orders over the last 2+ weeks!! I will draw the first set of winners at the end of the day tomorrow, and then …. the BIGGER giveaway winner!! So proud of you , Nicole! Great work! Those 500 books will be put to good use!